The device, called the NightWatch, has been created by a consortium of Dutch academic institutions and will be marketed by LivAssured. 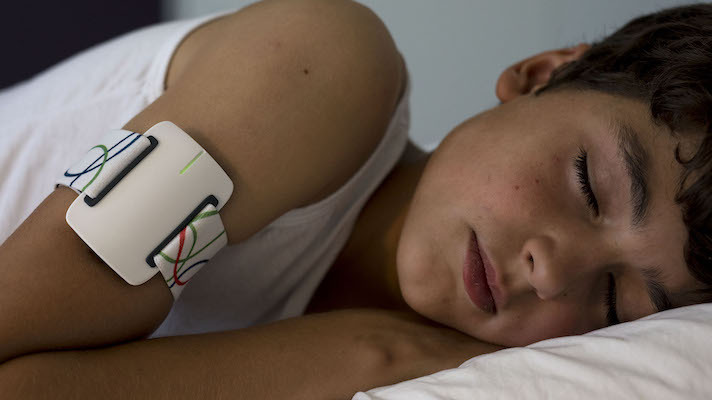 A new study in the journal Neurology shows that the NightWatch, a connected armband from Leiden, Netherlands-based LivAssured, detected nighttime epileptic seizures 85 percent of the time. The device has been under development for 20 years by a consortium that includes Kempenhaeghe epilepsy centre, Eindhoven University of Technology, the Foundation for Epilepsy Institutions in the Netherlands (SEIN), UMC Utrecht, the Epilepsy Fund, patient representatives and LivAssured. It uses a combination of heart rate and activity monitoring to detect night time seizures, then wirelessly communicates to alert caregivers or nurses. In the study, 28 patients were monitored over a total of 1,826 nights (averaging 65 nights per participant), in which 809 major seizures occurred. Researchers compared the wearable to a standard-of-care bed sensor and used video monitoring to identify seizures both devices might have missed. They found that the NightWatch overperformed relative to the bed sensors, detecting 85 percent of seizures and 96 percent of tonic-clonic seizures, the most serious variety. Night time seizures are among the most dangerous part of epilepsy and current ways of monitoring for them are inaccurate, bulky, or both. The study showed not only that NightWatch was reasonably accurate, but also that care providers found the system easy to use, giving it an average score of 7.3 out of 10 for user-friendliness. "SUDEP, sudden unexpected death in epilepsy, is a major cause of mortality in epilepsy patients," Product Manager Michiel Jansen wrote in a press release. "People with an intellectual disability and severe therapy resistant epilepsy, may even have a 20 percent lifetime risk of dying from epilepsy." LivAssured's NightWatch team has been perfecting its algorithm for a number of years and now hopes to offer the device in Europe, and eventually worldwide. "The Nightwatch can now be widely used among adults, both in institutions and at home," Jansen wrote. "[Neurologist and research leader Prof. Dr. Johan] Arends expects that this may reduce the number of cases of SUDEP by two-thirds, although this also depends on how quickly and adequately care providers or informal carers respond to the alerts. If applied globally, it can save thousands of lives." Epilepsy montioring has been recognized as a prime use case for connected wearables for a number of years, but when MobiHealthNews surveyed the space in 2013 we found most of the public efforts in the space had stalled. Lately, however, there's been more progress. Empatica, which produces the consumer-focused Embrace wearable and the clinic-facing E4, has been continuing to develop its devices after a successful crowdfunding campaign. Other projects have sought to leverage off the shelf sensors like the Microsoft Band to detect seizures.